The DVI-D and Stereo Audio to HDMI Converter is the perfect solution for connecting a source with a DVI-D video and a Stereo Audio output to a single HDMI input on a display. Most displays will not support a separate audio input when the HDMI input is used. This product provides a solution to that problem by allowing DVI-D video and Stereo Audio to be combined into a single signal that is sent over an HDMI cable to the display. The DVI-D and Stereo Audio to HDMI Converter extends the useable life of equipment by allowing a legacy source device to be connected to a new display. 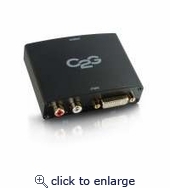 Note: The DVI-D and Stereo Audio to HDMI Converter is not designed to support analog signals. This device should only be used with a source device that produces a digital video output.